Stuart Scott was a longtime Sports mogul for ESPN, father and creator of the phrase "cooler then the other side of the pillow". Scott went in for an appendix operation doctors found a tumour but that was not going to stop him, he remained high spirited and focused on what he did best. "You beat cancer by how you live," he would later say. "So live. Live. Fight like hell." That battle ended sunday, at age 49 after a tedious battle with cancer Stuart Scott has passed. ESPN President John Skipper said in a statement that Scott was "a true friend and a uniquely inspirational figure"
Moments of silence were held at sporting events around the United States on Sunday, including the NFL wild-card games between the Cincinnati Bengals vs. Indianapolis Colts and Detroit Lions vs. Dallas Cowboys; the Mavericks-Cavaliers NBA game in Cleveland and at several college basketball games. Some famous athletes expressed their grief online. LeBron James wrote on Instagram: "Thank you so much for being u and giving us inner city kids someone we could relate to that wasn't a player but was close enough to them." 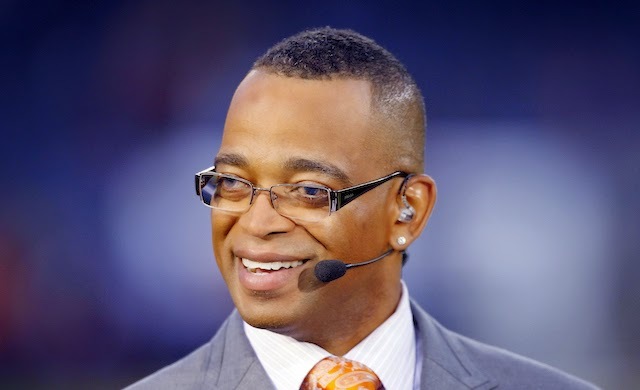 Stuart Scott will not be forgotten and his memories will forever live on "Boo-Yah!" Common and John Legend Win Golden Globe "Glory"
Slow Motion Balloon popping SICK!!!!! Is Snoop Dogg Being Sued Over Instagram Post?